Sclerotherapy is a medical procedure offered to our Dundas clients at our Hamilton location used to eliminate varicose veins and spider veins. Varicose veins are veins that have become enlarged and twisted. 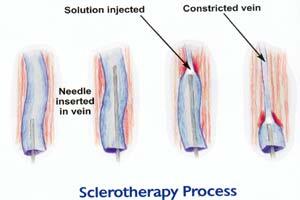 Sclerotherapy involves injecting small amounts of a sclerosing agent directly into the spider vein using a very small needle. The solution irritates the lining of the vessel wall, therefore causing it to stick together. The procedure, requires no anesthesia. Potential side effects include bruising, swelling, and slight skin discoloration. Over a period of several weeks the vessel turns into a scar which fades away. Eventually, the vessel becomes barely visible or not visible at all! You can expect an improvement of approximately 80% in treated vessels. The number of sessions required depends upon the severity of the problem. A better assessment can be given during your complimentary consultation at our Hamilton location serving Dundas clients. All injections are performed by our qualified medical staff under supervision of Dr. McDonald, our supervising medical director. Laser therapy is another alternative medical procedure that also can be performed in your physician's office. It is sometimes used as a complement to Sclerotherapy in order to maximize results. It is most effective for spider veins and tiny varicose veins in legs and other parts of the body. For those individuals who do not like needles, this provides an alternative option, though your physician will counsel you on which treatment modality is best given your particular situation. Laser therapy uses a focused beam of light that heats and damages the affected blood vessel, which eventually fades. Potential side effects include minor redness or swelling around the treated area, skin discoloration, blisters, and rarely scarring. Intense Pulsed Light (IPL) therapy is a recently developed treatment for spider veins. IPL delivers pulses of different bands of light to targeted areas. Dundas clients, Call us at 1-888-332-9930 OR request a consultation online to get more information about Sclerotherapy and get started with one of our Registered Nurses.